This workshop is for you if you feel drawn to The Wisdom Keepers Oracle Deck, and would like to add an element of creativity, depth, play and synchronicity into your work with clients and students. This unique deck incorporates the 64 Faces of Awakening and The Wisdom Keepers Inner Guidebook as empowering tools of self-acceptance and understanding, a playful, creative and profound way to help your clients and students embrace their shadows with love and uncover the gifts that only they can bring to the world. Rosy lived in Denmark a long time ago, and is married to a Dane. So even though she will be teaching in easy English, she understands and can speak some Danish. 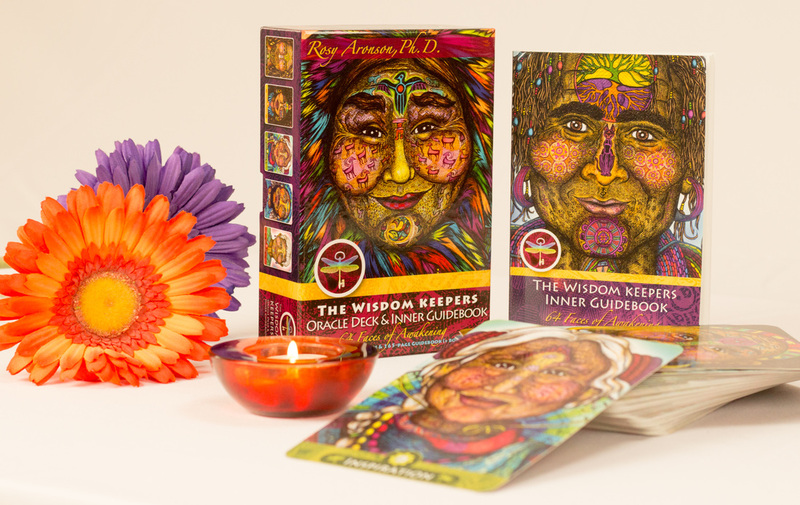 All participants will be receiving and working with their own full-color edition Wisdom Keepers Oracle Deck. ​to work with emotions, fears and life challenges. ​The 64 Faces of Awakening began as a meditative, intuitive and deeply personal journey. Throughout the creative process, Rosy’s intention was to bring forth 64 unique human faces as a means of reclaiming, reflecting and celebrating the soul of the world—a miraculous multiplicity of ONE. Infused with evocative shapes and universal symbols, this diverse family of Wisdom Keepers connects us with our collective evolution and indigenous roots, represents both ancient and new human archetypes, and embodies the peace, love and compassion so needed in our world. In The Wisdom Keepers Inner Guidebook, the Wisdom Keepers share their teachings through intimate stories, contemplative questions and practical suggestions. Each story illustrates just how often our deepest wisdom and highest potential grow out of our most painful or challenging experiences. The compassionate, accepting and permission-giving faces of the Wisdom Keepers encourage the formation of healthy, loving attachments. Gazing into their eyes, people are invited to drop in and access the full spectrum of their emotional experience. When encouraged to reflect upon the deeply human wisdom teachings and contemplative questions, people naturally open up to intimate conversations, breakthrough insights and transformative explorations. Rosy Aronson, PhD, is an inspirational artist, author and counselor. Her deepest intention is to provide empowering tools for people to awaken to their gifts and bloom into their authentic selves. With this in mind, Rosy has created the 64 Faces of Awakening, The 64 Faces of Awakening Coloring Book, The 64 Faces Coloring Project, The Wisdom Keepers Oracle Deck and The Wisdom Keepers Inner Guidebook to reflect essential healing archetypes that lie at the foundation of our universe. Rosy’s artwork has graced public shows and private collections in the U.S. and Europe. Along with her art and writing, she enjoys a full-time counseling practice. She lives with her Danish husband and daughter in Berkeley, California.